Bluetooth, Rear View Camera, SiriusXM, Air Conditioning, Power Windows! This Nissan Rogue boasts appealing looks, advanced safety features, and impressive creature comforts. 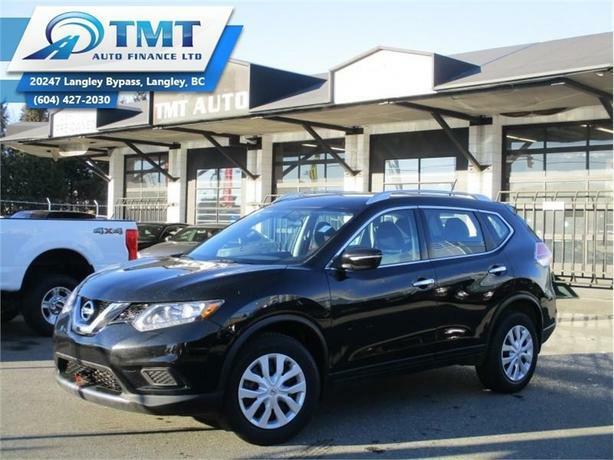 This 2015 Nissan Rogue is for sale today in Langley. Take on a bigger, bolder world. Get there in a compact crossover that brings a stylish look to consistent capability. Load up in a snap with an interior that adapts for adventure. Excellent safety ratings let you enjoy the drive with confidence while great fuel economy lets your adventure go further. Slide into gear and explore a life of possibilities in this Nissan Rogue. It gives you more than you expect and everything you deserve. This SUV has 94492 kms. It's black in colour and is major accident free based on the CARFAX Report. It has a cvt transmission and is powered by a 170HP 2.5L 4 Cylinder Engine. This vehicle has been upgraded with the following features: Bluetooth, Rear View Camera, Siriusxm, Air Conditioning, Power Windows, Power Doors. It may have some remaining factory warranty, please check with dealer for details. Our Rogue's trim level is S. This Nissan Rogue S is a versatile crossover at a great value. It comes with Bluetooth hands-free phone system, SiriusXM, a USB port, a rearview camera, a folding, sliding, reclining second-row bench seat, air conditioning, power windows, power doors, eco mode, roof rails, power, heated mirrors, and more. Buy this vehicle now for the lowest bi-weekly payment of $120.46 with $0 down for 84 months @ 4.99% APR O.A.C. ( Plus applicable taxes - Plus applicable fees ). See dealer for details.